Stall & Craft Collective offers an online no-commission marketplace for stallholders and customers, with an extensive list of upcoming events, craft fairs and craft markets in your local area, together with interviews, news and updates features. Event organisers are able to register and advertise all of their events for free, whilst registering as a stallholder to sell your items on our online marketplace and promote your business costs from just £15.00 per year. We do however now have additional paid for advertisement opportunities which we are confident will be of interest to you. Advertising with Stall & Craft Collective starts from just £15.00 per month and and represents a great opportunity to reach your target audience. 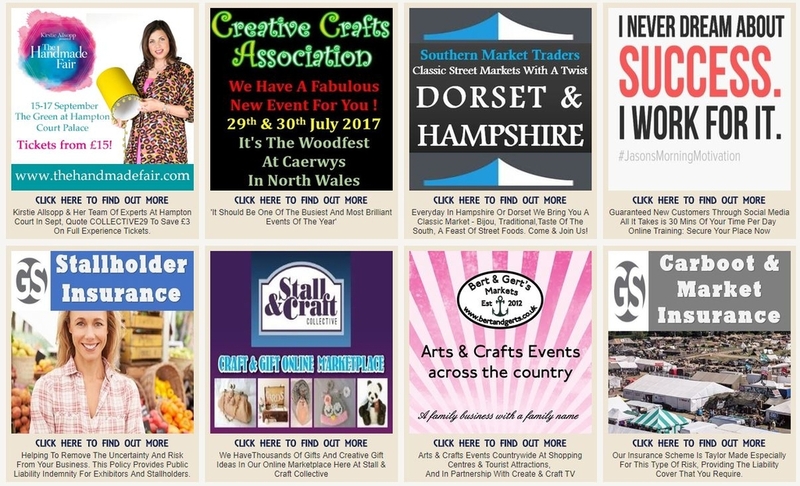 We can create an eye catching advert for you which will be present on all the main pages and landing pages within our website along with every event listed with us from across the UK. A large image, informative narrative, a web link, and a randomised order of listed adverts are all part of the package that will provide that extra and welcome push to attract customers. We will also create and publish a number of special features for you on the website and our social media platforms for you at no extra cost. So whether it’s to increase the success of an existing event, publicise the arrival of a new event, advertise venues available to book for events, or promote your product or service, advertising with us represents a significant opportunity to increase the success of your venture. We can also tailor custom packages to your specific budget should you so wish so please just tell us what your budget is and we can then further discuss what we can offer. How do you take advantage of this great offer? Well, that’s easy! Just email us at info@stallandcraftcollective.co.uk asking for details and setting out your requirements and we’ll come straight back to you with all the information you need, together with any help and advice we can offer. Alternatively, just call us on 07866-612697 and ask for Mark and we can have a friendly informative chat about how we can help you. Don’t worry, contacting us won’t mean you have committed yourself to anything; it just means you have more information in order to make an informed choice now or in the future.